The family of the 7-year-old girl who died while in border patrol custody is calling for a "transparent and neutral investigation" into the circumstances that led to her death, attorneys representing her heartbroken family said in a statement Saturday. The tragic death of Jakelin Caal Maquin, who was only five days past her birthday when she died after crossing the U.S.-Mexico border earlier this month, should be investigated within "nationally recognized standards for the arrest and custody of children," said Ruben Garcia, the director of Annunciation House, a non-profit organization working with her family. "The family intends to assist in such an investigation into the cause and circumstances of Jakelin's death," Garcia read from a statement prepared by the family's attorneys, during a Saturday afternoon press conference in El Paso, Texas. Garcia spoke on behalf of Jakelin's parents: her father, Nery Gilberto Caal Cruz, with whom she crossed the border; and her mom, Claudia Marivel Maquin Coc. Jakelin "was a beautiful and loving child," Garcia said during the news conference. "Jakelin and her father came to the United States seeking something that thousands have been seeking for years: An escape from the dangerous situation in their home country," Garcia read, referring to Guatemala. "This was their right under U.S. and international law." 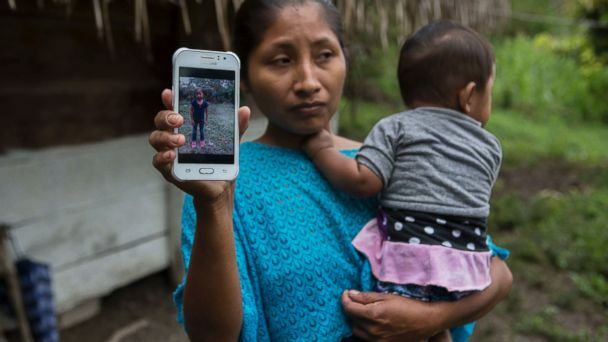 Late Saturday evening, Guatemalan Consul Tekandi Paniagua told ABC News that Cruz -- Jakelin's father -- was grateful to the border patrol and the doctors who tried to save his daughter's life. "When I spoke to the father he actually said he was very grateful for the effort of both the Border Patrol agents that assisted his daugther at the station as well as the medical staff at the hospital," Paniagua said. Cruz' sentiments were first reported earlier Saturday by CNN. Jakelin's death became public Thursday, five days after she died from dehydration and cardiac arrest, and sparked out sparked outrage from Democrats and immigration advocates alike. "There are no words to capture the horror of a seven-year-old girl dying of dehydration in U.S. custody," former presidential candidate and Secretary of State Hillary Clinton tweeted Friday. "What's happening at our borders is a humanitarian crisis." Department of Homeland Security and Border Patrol officials on Friday defended their handling of the incident. Among the challenges cited, DHS and CBP said it took 90 minutes to get Jakelin medical attention after Caal Cruz alerted agents that she was sick. Four border patrol agents apprehended a group of 160 migrants -- among them Jakelin and her father -- and there was no medical staff nearby. Finally, a CBP official with direct knowledge of the investigation told ABC News that a single bus equipped to transport children from a remote part of the New Mexico border had to make two trips to take everyone. Jakelin had to wait four hours for the bus to return for her and her father, the official said. Jakelin later had a 105.9-degree fever and had to be airlifted to a children's hospital in El Paso. That's when she went into cardiac arrest, suffered brain swelling and liver failure, according to CBP and DHS officials. She died less than 24 hours later, DHS said. But Jakelin's family said through Garcia the little girl had been taken care of by her father, who made sure she had eaten and was hydrated. "She had suffered from a lack of water or food prior to approaching the border," Garcia said Saturday. Garcia added that Jakelin and her family who speak Q'eqchi, and Spanish as a second language. They don't speak English, Garcia added, yet Caal Cruz filled out an English form during processing. "It is unacceptable for any government agency to have persons in custody sign documents in a language that they clearly do not understand," Garcia said. They urged patience while the medical examiner in El Paso County, which conducted Jakelin's autopsy, makes a public statement regarding the cause of death. Her body has left El Paso and is being transported to a funeral home in Laredo that works with Guatemalan consulate. From there, her body will be repatriated to Guatemala, Garcia said. "The family of Jakelin ... is still coping with their profound loss," Garcia said. "The death of a child is the most painful experience that a parent or family can endure." ABC News' Cheyenne Haslett and Tom Llamas contributed to this report.